Vienna (AFP) - Austria introduced a daily cap on asylum-seekers, sparking EU fears of a domino effect along the Balkan migrant trail and a threat from Greece to veto an accord keeping Britain in the bloc. A maximum of 80 migrants per day are now being allowed to claim asylum in Austria, and Vienna is also limiting the daily number of people transiting through to seek asylum elsewhere to 3,200. 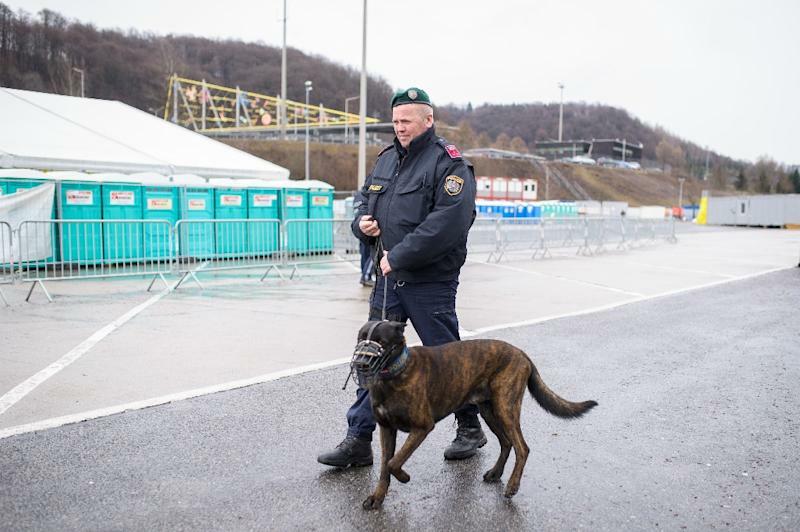 The arrival of more than a million refugees and migrants in Europe last year has caused a chain reaction of border clampdowns among several member states. As the main gateway into the EU, Greece has been struggling to cope with the new arrivals and fears new restrictions by other members will leave tens of thousands of people stranded on its territory. But EU sources said Greece had reached an informal agreement with Austria to "cooperate better" on migration. Faced with being excluded from the EU's passport-free Schengen zone, Greece had pinned its hopes on the EU and Turkey firming up a deal to stem the migration flow at a special summit on March 6. "We are asking for a unanimous decision that until March 6, no state will unilaterally close its borders," a Greek government source told AFP Friday before the reform deal was reached. "If not, the Greek government will not approve the conclusion text," the source said. But EU sources said Greek Prime Minister Alexis Tsipras's concerns eased after meeting with Austrian Chancellor Werner Feymann on the sidelines of an EU summit in Brussels. The pair reached "an agreement to cooperate better" on migration, an EU source told AFP on condition of anonymity. "Tsipras seemed happy with the outcome." Another EU source told AFP that Austria would not close its borders before the EU-Turkey summit. Under a German-backed EU proposal to be discussed in March, Turkey would curb the flow of migrants and then fly refugees to Europe for resettlement in exchange for three billion euros ($3.3 billion). However, central European countries are opposing the resettlement scheme and are instead pushing to seal Greece off from the Schengen zone. 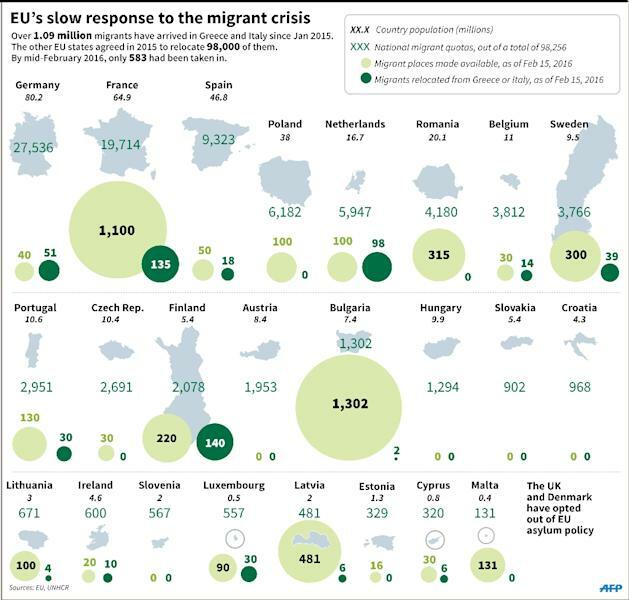 Deep rifts within the 28-nation EU have opened in the face of Europe's biggest migration crisis since World War II. More than 80,000 people -- many of them children -- have endured the perilous journey across the Aegean Sea since January, most fleeing war and violence in Syria, Afghanistan and Iraq. Brussels on Friday clinched a deal to keep Britain from potentially leaving the EU by giving it "special status" in the bloc, including allowing London to limit welfare payments for migrants. But Austria's move to cap migrant numbers has sparked an angry reaction from Brussels, which called it "incompatible" with EU law. Austria's Interior Minister Johanna Mikl-Leitner warned on Friday the cap could be lowered even further, saying: "We need to put the brakes on." Following Austria's tighter measures, Slovenia, Croatia and Serbia have also tightened their borders. 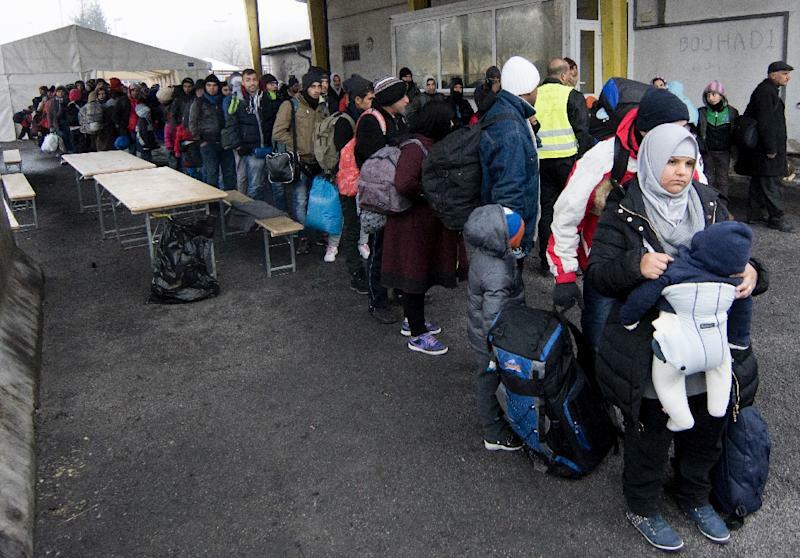 Austria announced last month it would only take in 37,500 asylum-seekers this year -- sharply down from the 90,000 it accepted in 2015, making it one of the bloc's highest recipients on a per-basis capita. Vienna has joined the so-called Visegrad Four (V4) group -- Hungary, Poland, Slovakia and the Czech Republic -- in their call for tighter EU controls inside Schengen. Germany, which received more than one million asylum claims in 2015, acknowledged that the EU "must see quickly if measures (agreed with Turkey) work". A meeting with Turkey and the leaders of 11 EU countries had been planned before Thursday, but was cancelled when Turkey's premier Ahmet Davutoglu pulled out following a bomb attack in Ankara. Portugal said on Friday it had offered to take 5,800 extra asylum-seekers, on top of 4,500 already accepted, to help countries "where the migration pressure is strongest", including Austria, Sweden, Italy and Greece.